SCI Management at the Accident Scene has, in addition to the fundamental life-saving goal, three main objectives: to minimize neurological deterioration, to mobilize the patient as soon as possible, and to implement an adequate rehabilitation. The early care of the injured patient starts immediately, at the site of accident. It has previously been shown that up to 25% of spinal cord injured patients suffer further neurological deterioration before arriving at the hospital. In some instances, this could be avoided. Adequate management immediately after injury is vital and will optimize survival in the short term and the ultimate neurological outcome in the long term. The proportion of patients with complete lesions has diminished from 65% during the 1970s to approximately 45% in later studies. The number of patients with deteriorating neurological function during pre hospital transfers has also been reduced. In cases of incomplete SCI, which results in subtotal loss of function below the level of injury, the prognosis is better and the consequences less devastating as compared to those associated with a complete lesion, which results in total loss of function below the level of injury. Since most traumas result in incomplete SCI, careful and adequate SCI Management at the Accident Scene in combination with qualified medical management at the emergency hospital are vital prerequisites to reduce the impact of secondary injury and give the injured individual the best hope of regaining at least some neurological function. Up to 60% of all patients with acute traumatic SCI prove to have injuries to other organ systems as well. Head trauma associated with unconsciousness, injuries to the chest and abdomen, and multiple fractures occur frequently. Identification of trauma patients at risk is the first step in the evaluation and SCI Management at the Accident Scene. These responsibilities are presented separately here, but are, of course, often performed simultaneously in view of the needs of each individual. • Airway. Airway maintenance including administration of oxygen. The cervical spine must be protected if an injury to the cervical spine or spinal cord is suspected. • Breathing and ventilation. The patient must be guaranteed adequate ventilation. Oro- or nasotracheal intubation if breathing capacity is inadequate. • Circulation with hemorrhage control. Ensure adequate circulation by stopping ongoing external bleeding and initiating intravenous fluid therapy with balanced body-temperature saline solutions. • Disability. Consciousness (according to Glasgow Coma Scale [GCS]) is assessed, as is the motor and sensory function in arms and legs. • Exposure/environmental control. Evaluate the environment of the scene of accident. This includes measures to prevent hyper and hypothermia, respectively. If needed, undress the patient completely. The aim of this primary survey is to confirm that life-saving measures have been performed. The subsequent secondary survey consists of a more careful head to toe evaluation, to detect possible additional injuries. This evaluation includes a characterization of the approximate neurological level and completeness of the sensorimotor losses. The secondary survey does not start until the primary survey is finished, resuscitative measures are established, and the patient is showing stabilized and normalized vital functions. The secondary survey includes a brief but comprehensive patient evaluation that includes a history and physical examination of all body organs. Aggressive resuscitation and treatment of life threatening injuries is simultaneously performed with the primary survey. Resuscitation is focused on airway, breathing and circulation (the ABCs). The purpose of immobilization is to prevent unnecessary movements (e.g., distractions) of the spine, thus preventing further trauma to the spinal cord. It is recommended that all patients be immobilized at the scene of accident if a spinal column or cord injury is either suspected or verified. Immobilization is performed as soon as possible, with regard to the patient’s general condition. Traction using weights has been used as a immobilization device, but this method should not be used due to the risk of over distraction of the cervical column in situations where severe disruption, mainly to the upper cervical region, may be present. Over distraction may cause secondary mechanical injury to the spinal cord and further deterioration of neurological symptoms. Up to 20% of spinal cord injured patients present with more than one fracture to the spinal column. The entire body must, therefore, be immobilized and secured in order to prevent unnecessary movement of the spinal column. Consequently, a rigid cervical collar, sandbags placed to each side of the head, and taping the forehead down to the board secures the neck while the rest of the body is fully immobilized using foam blocks and tape on a long spineboard. If a patient is found on the ground at the scene of an accident, neutral in-line immobilization of the neck should be effected as soon as possible. One person (“Person 1”) carefully grasps the patient’s head and moves it into a neutral inline or “eyes-forward” position. This maneuver must be done very gently and stopped if pain increases, ventilation is disturbed, and/or neurological symptoms increase. The neck should be immobilized in a non–in-line position if any of these symptoms occurs. A second person (“Person 2”) applies a hard cervical collar once the neutral position is obtained while Person 1 maintains the eyes-forward position and prevents any movement of the cervical column. It is important that the hard cervical collar be sized correctly to avoid having the chin rest inside the collar support. The cervical collar should be applied before any other part of the body is moved. The patient is rotated to one side using the logroll maneuver with spine precautions in order to examine the spinal column. The technique demands at least four individuals and aims to avoid movement in the spinal column during the rotation, thus making it possible to investigate the spine while it remains in a straight position. 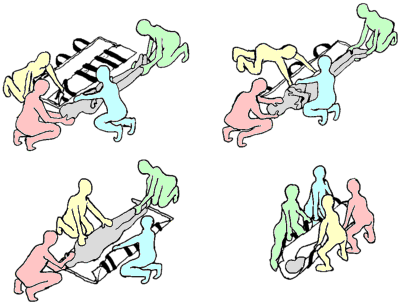 Person 1 is responsible for maintaining the neutral in-line position of the head and neck and coordinates the subsequent log-roll maneuver and placement of the patient on the spine board. The remaining three individuals simultaneously turn the chest, pelvis, and extremities. Signs such as local tenderness, focal hematomas, and an increased distance between spinal processes, indicate skeletal, muscle, and/or ligament injury. The patient is turned back to the supine position, using a reverse log-roll maneuver, after the examination is finished and is simultaneously placed on a spine board. The cervical collar alone does not completely immobilize the cervical spine. The head must be secured using adhesive tape or its equivalent after the patient’s body has been placed on the spine board; this prevents rotational movement and achieves complete immobilization. The spine board is an excellent means of transportation for immobilized patients, but because of the risk of pressure ulcers (especially in the sacral region), patients should not be immobilized thus for more than 2 hours. Protective padding, such as a gel mattress, may be used to minimize the risk of pressure sores. Following a motor vehicle accident, the neck is secured using a similar program of immobilization used for a patient found on the ground, adapting the in-line immobilization as needed to the situation. Helmet removal I. In helmet removal, the first rescuer places her hands on the mandible, which allows the neck to remain in a neutral position. Helmet removal II. The second rescuer opens the chinstrap after which the first rescuer continues to stabilize the mandible and neck. Helmet removal III. The second individual then removes the helmet and the helmet is initially expanded to uncover the ears. The first rescuer holds the head in neutral position while the second person finally applies the hard cervical collar. In general, helmets need not be removed unless airway problems are detected, the helmet obscures extensive hemorrhage, or if it is too loose to secure an acceptable immobilization. If the helmet is removed, this is done by two individuals using a three-step procedure. 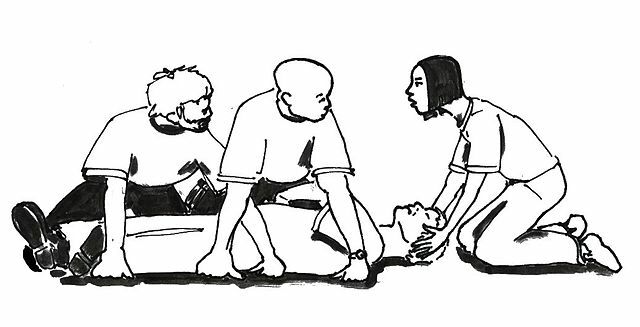 The final step in the ATLS guidelines involves the extrication of the patient from the scene of the accident and into an ambulance or helicopter. The overall goal is to remove the spinal cord injured patient from the scene of accident safely for transportation; that is, without aggravating his neurological status. Speed may be important, but the most important goal is to stabilize all vital organ systems before transporting the patient to an emergency unit. American College of Surgeons Committee on Trauma. Advanced trauma life support for doctors. Student course manual 1997. ISBN-1-880696. Ball PA, Chicoine RE, Gettinger A. Anesthesia and critical care management of spinal cord injury. In: Tator CH, Benzel CH, eds., Contemporary Management of Spinal Cord Injury: From Impact to Rehabilitation. Park Ridge, IL: American Association of Neurological Surgeons, 2000:99–108. Bernhard M, Gries A, Kremer P, Bo¨ttiger BW. Spinal cord injury (SCI)– prehospital management. Resuscitation 2005;66(2):127–139. Review. Whetstone W. Prehospital management of spinal cord injured patients. In: VW Lin, ed., Spinal Cord Medicine: Principles and Practice. New York: Demos Medical Publishing, 1996:107–111. Hadley MN, ed. Cervical spine immobilization before admission to hospital. Neurosurgery 2002;50(3): S7–S17. Hadley MN, ed. Transportation of patients with acute traumatic cervical spine injuries. Neurosurgery 2002; 50(3):S18–S20. Sheerin F. Spinal cord injury: acute care management. J Bone Joint Surg Am 2009;91(11):2568–2576.